Beginning in 2018, visitors to 10 Vans® brand stores in California will be greeted by a kiosk containing a bin for used footwear they no longer want. Depositing their old shoes gives consumers reassurance that their discarded items will gain a second life. Participating consumers will also have an opportunity to provide feedback to the Vans® designers. The kiosks, designed to make product takeback easy and accessible, are a step in the transition from a linear to a circular system where materials are always reused, recycled or repurposed. It is estimated that consumers dispose of roughly 70 pounds of clothing each year, accounting for 9 percent of the world's total non-recycled waste. We see this as an opportunity to shift behavior and recapture valuable resources while also reducing potential environmental impacts. Within VF, this takeback journey was pioneered by The North Face® brand with the 2014 launch of Clothes the Loop, an experiment to test consumers' appetite for apparel recycling. Clothes the Loop invited consumers to bring back their used clothing in exchange for a $10 reward toward their next purchase of $100 or more. The returned apparel was taken to a recycling center and carefully sorted. The materials recovered were repurposed into products such as insulation, carpet padding, stuffing for toys and fibers for new clothing. 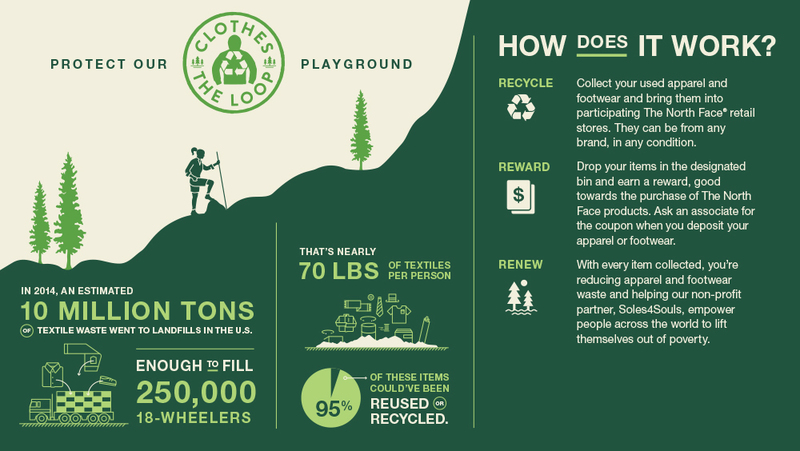 Since the launch, The North Face® brand's stores have collected and diverted more than 71,000 pounds of clothing and footwear away from the landfill. Today, Clothes the Loop is live at 150 stores around the world. In 2016, the Timberland® brand launched Second Chance with a similar objective in Germany. Today, Second Chance is running in 57 full-price and outlet stores across Europe with proceeds going to the Bergwald Project, as well as 23 stores in the U.K. with proceeds going to TRAID, an organization that resells items collected in their charity stores across the U.K. to find international development programs that improve working conditions and practices in the textile industry. Overall, these takeback programs are proving valuable for the respective brands and their beneficiaries. The kiosks, which represent a key component of our efforts to transition to a circular system, are only scratching the surface of what we hope to achieve: to transform the apparel industry from linear to circular by creating a readily available flow of recyclable and recycled raw materials. We will provide updates on our progress as we continue down this path. For us to pursue circular business models, we are building the infrastructure to extend the life of our products. Take a look at how we are helping give many more products a second life while informing the design of our future products, pioneered by The North Face® and Eaglecreek®, through warranty and takeback programs. Pounds of shoes collected by the Vans® brand through the Skate and Donate program in Europe.